ForumWindows 7 Operating SystemWindows Updates will not install. That sounds like a plan, but it would be interesting to see the actual files listed (not the clean list, but the one containing the .Net files) and the program settings. I did not think to take that picture...after all we have been through with this problem, when I saw those bad scan results from CCleane, I just panicked. Thank you so very much for all your help. Daves Computer Tips Forum is the best! 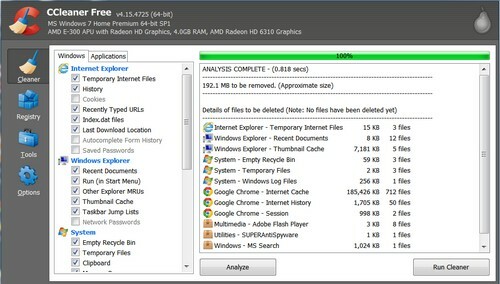 Avoid using multiple system cleaners even if that's simply to check the veracity of the one you just used. In fact, why use system cleaners at all if the system has just been reset as very often it's nothing more than a placebo effect? If you continue to see errors, it's more than likely to be some glitchy hardware problem and the first place I would look is by running a specific hard drive test by downloading diagnostic hardware from the drive manufacturer IE Western Digital or whoever. Back up everything and always consider a format/reinstall, which I think you just did.